Jean-Gabriel Pageau releases his shots just a second before the horn goes off at the end of the third. The Blues (37-20-9) saw the Ottawa Senators (30-27-7) rally from a 3-1 deficit to tie the game on a pair of goals by Jean-Gabriel Pageau in the final 2:41 of the third period, including the tying goal with .1 left on the clock. Then after the five minute overtime, it took 11 rounds of the shootout to gain the extra point. 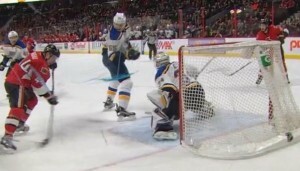 Patrik Berglund scored on a shot that beat Senators goalie Andrew Hammond on his glove side after Jake Allen made 11 shootout saves. Jaden Schwartz had a goal and two assists. Schwartz, who missed 49 games this season with an ankle injury, scored his fifth goal of the season and has nine points in 10 games since returning on Feb. 12. Dmitrij Jaskin and Vladimir Tarasenko. It was Tarasenko’s 30th of the season. Allen made 40 saves for St. Louis, which got the two points after failing to hold a 3-0 lead in the second period.